(Tianya) People's Daily Reporter Assaulted While Gathering News In Fenghuang. August 16, 2007. At 11:30am on August 16, a People's Daily reporter together with a China Youth Daily reporter, a Southern Metropolis Daily reporter, an Economic Observer reporter and an Observe Orient Weekly reporter went to the Baiqing Hostel where the families of the victims of the Fenghuang bridge collapse were placed. The family of Chen Jiaxiang from Lianyuan had five dead men, and the women and elders were crying with sorrow. There was nobody at the reception. The local government required that only reporters with press permits be allowed at the scene of the accident and the scene of the medical treatment, but no press permit was required at the hostel. The reporters felt that their news gathering was legal. At around 11:30am, a middle-aged man with glasses and red-clothes came in to ask us to show our work permits. At the time, he did not identify himself and we obviously refused. About 10 minutes later, the man brought in a group of seven or eight people including 3 women. He demanded aggressively for us to show our work permits. So Wang Weijian said that he was from People's Daily and he asked the other party to show his work permit. But they did not show their work permits. They only said that they were workers. They wanted us to leave. We said that we were tourists and we have the right to be there. The men in red clothes said, "If you are tourists, you better leave!" At the time, Wang Weijian was sitting with his back to the door. Someone shoved him hard in the head, and then repeated that. It was a man wearing white and about 1.75 meters tall (I felt that he was an enformer). He came up and tried to grab Wang Weijian's wrist. When he did not succeed, he went and shoved Wang a few times. By that time, the other reporters came up to stop the man in white. During the tussle, someone kicked the China Youth Daily reporter and they kept assaulting us. The four reporters at the scene took out their identity documents and explained who they were, but they were still assaulted by seven or eight people for almost five minutes. (the Economic Observer reporter had gone out to photocopy something but he was assaulted when he returend). At that time, the People's Daily reporter Wang Weijian stood up and stood in front of the other four reporters. Since Wang had the work permit, he pointed to his own face and told the man in white: "You hit me in my face. You can hit me hard." Of course, the man was scared to hit his face, but he continued to hit the rest of us. At that time, Wang saw that the situation was getting out of control and he took out his press card. He said, "I am from the People's Daily." Then they stopped, even though they still wanted to charge at us! During the whole episode, the reporters were relatively restrained. Wang Weijian and Hong Kefei received more injuries than the rest. By that time, we had called the police. When the police arrived, they called us and said that they could not find the location. Therefore, they asked the reporters to go downstairs to show them the way. But the man in red and his people blocked us from going and restricted our movement. The police eventually found us. They were led by a deputy squad leader named Yang. They examined the identity papers of the five of us. But the police did not examine the identity paper of the man in red. Deputy squad leader Yang held a private conversation with the man in red. Later, we were taken down to the police reception center in a white van. According to informed sources, the man in red was the local Department of Agriculture director and the attackers all worked for the Department of Agriculture. 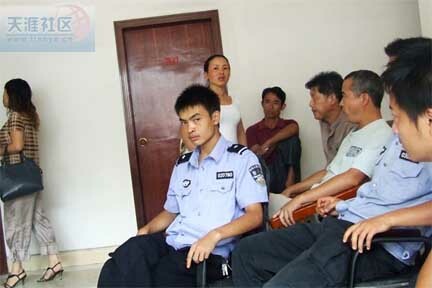 Wang Weijina, Hong Kefei, Long Zhi and the other two were brought down to the local police station to take notes. 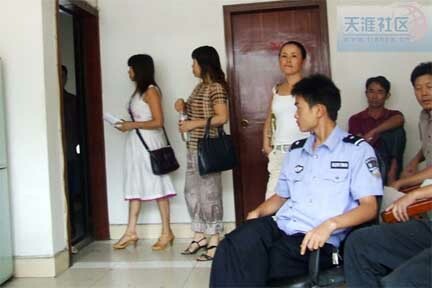 A deputy county mayor named Tian in charge of agriculture was also down at the police station. According to the reporters, during the note-taking, Xiangxi party standing committee member snad publicity department director Zhou Xiaomao came down to the police station and pulled Tian aside to ask who the reporters were. When he learned that there were people from People's Daily and Xinhua/Obseve China, Zhou immediately told those reporters: "I apologize on behalf of the locals for this infelicitous event." Then Zhou turned around and told the reporters from China Youth Daily, Southern Metropolis Daily and Observe Orient Weekly, "Apart from People's Daily and Xinhua, all of you are gathering news illegally. We will take steps against you for these illegal activities." At that time, someone began videotaping these reporters. China Youth Daily reporter Hong Kefei protested. Zhou said that he was going to get the Hunan provincial external publicity department to fix us. Hong immediately dilaled the telephone number of the Hunan provincial external publicity department and Zhou backed off. Hunan provincial publicity department deputy dirctor Kong Huoping arrived at the scene and stopped the videotaping of the reporters by Fenghuang. He invited the reporters to a conference room on the fourth floor of the county party committee hostel. He invited the reporters to attend the press conference that afternoon. He promised that he will form a team to investigate the assault on the reporters. The reporters said: The five newspaper reporters were there to interview the families of the victims. We wanted to understand what was happening. The local leaders from the hometowns of the victims were there and they supported our efforts. But somehow this episode happened. The five of us represented five newspapers in order to gather news. We were carrying a public service on behalf of our five newspapers. The man in red had no right to punish people and their assault on us was totally illegal. There is no possibility for settlement between us. We hope that the local government will handle this case seriously and reveal the identity of the man in red and the basis by which he assaulted us. Afterwards, deputy director Tian of Fenghuang county was exceedingly arrogant ... if this case does not get handled satisfactory, we will personally sue the Fenghuang government. (cnest.com) (note: This item has been 'harmonized') August 16, 2007. At 16:45pm on August 13, the Dixi bridge under construction in Fenghuang county, Xiangxi Autonomous Region, Hunan province collapsed. As of 9pm last night, out of the 123 persons working at the bridge, 64 survived, 37 died and 22 are missing. According to a reporter, he and reporters from People's Daily, China Youth Daily, Southern Metropolis Daily were trying to gather news when they were surrounded and assaulted. At the police station when the police recorded their statements, a person who claimed to be the Xiangxi party standing committee member and publicity department director said that the reporters were illegally gathering news and he wanted to take the reporters away for investigation. At 11:30am on August 16, five reporters from People's Daily, China Youth Daily, Southern Metropolis Daily, Economic Observer and Observe Orient Weekly were gathering news at the hostel where the families of the victims were staying. During the process, a 40-something-year old man in red clothes and wearing glasses came in and observed for a few minutes. Then he exited and he brought seven or eight persons (including two middle-aged women) to the scene to prevent the People's Daily Hunan bureau reporter Wang Weijian from interviewing. He claimed to be "a government person." The reporters demanded that he produce identification but he did not. Suddenly a man kicked Wang Weijian in the waist. When China Youth Daily reporter Hong Kefei tried to stop this brutal act, he was also kicked. When Southern Metropolis Daily reporter Long Zhi tried to intervene, he was assaulted by the other people brought along by the man in red. Wang Weijian, Hong Kefei and Long Zhi received various degrees of injuries. During the assault, the two other reporters called the police. When the assault was done, the other party blocked the hostel exit to prevent the reporters from leaving. The police arrived and stopped them. The reporters asked the eyewitnesses who the man in red was, and an "informed source" said that it was the local Department of Agriculture director and the attackers were all people with the Department of Agriculture. At past noon, Wang Weijina, Hong Kefei, Long Zhi and the other two reproeters were taken down to the local police station for their statements. According to Long Zhi, during the note-taking, a man claiming to the Xiangxi party standing committee member and publicity department director came down to police station and said that only the People's Daily and Xinhua reporters will be received whereas the news gathering by the other reporters were illegal. He wanted to take the other reporters away for investigation.